A decision on transforming part of Carmarthen town centre into a cafe quarter has been delayed. The county council wants to enhance Jackson's Lane with a new public square, cafes, shops, offices and an outdoor screen. 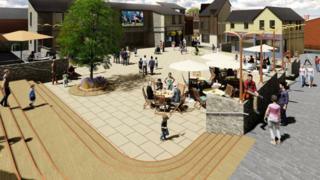 It hopes it will attract footfall and "define the square as a destination". Objections have been made over the loss of green space, but the application was recommended for approval at Thursday's planning meeting. However the committee adjourned the decision for a site visit, on a date yet to be confirmed. The cafe and business units would consist of a single two-storey building with the outdoor screen proposed for the front of the building, which would show sporting events, film festivals and university lectures. The council said its "fundamental objective" was to increase economic activity in the old parts of the town by transforming the "existing unappealing back route through Jackson's Lane and Chapel Street into a busy and attractive thoroughfare".